Hank Erickson was already very familiar with Royal Columbian Hospital in the fall of 2014, when he was rushed there by ambulance for what turned out to be a small vessel stroke. For two decades previously, he had walked its corridors daily, visiting staff and patients as the hospital’s chaplain. It was during that time he first encountered a patient who would eventually be considered one of the country’s greatest heroes of the 20th century: Terry Fox. He had been with Royal Columbian for a few years when he first encountered Terry Fox. Hank was part of a three-person team assigned by the hospital to manage the attention created when Terry was admitted to Royal Columbian. The young man was well known by then, having captured the attention of Canadians after launching his Marathon of Hope by dipping his artificial leg into the Atlantic Ocean on April 12, 1980. On September 1st of that year, Terry was forced to end his attempt to cross the country when cancer spread to his lungs. As Terry battled the disease, Hank made regular bedside visits. Hank was responsible for managing Terry’s visitors. There were lots of people hoping to see him. And lots of media attention, which Hank’s wife Carol remembers. As Terry’s health deteriorated in June, 1981, Hank says the 22-year old asked him to deliver the homily at his funeral. Then on June 28, Terry passed away. His family was with him, and Hank says he was there too. Carol says her husband has never really discussed that moment with her, let alone others. “He kept the whole thing so it was just between him and the Fox family,” she says. The funeral was broadcast across the country. Hank had conducted hundreds of funerals before, but nothing as far-reaching as this. As he spoke during the service, Hank made note of Terry’s ability to bring people together. It’s a legacy that carries on today, decades later. Left: Hank and his wife Carol look at mementos from Hank’s time with Terry Fox. Right: Hank with a magazine cover from 1981. Reminiscing on his own 85th birthday, Hank speaks fondly of his days at Royal Columbian. He also thinks highly of the care he’s received as a patient. 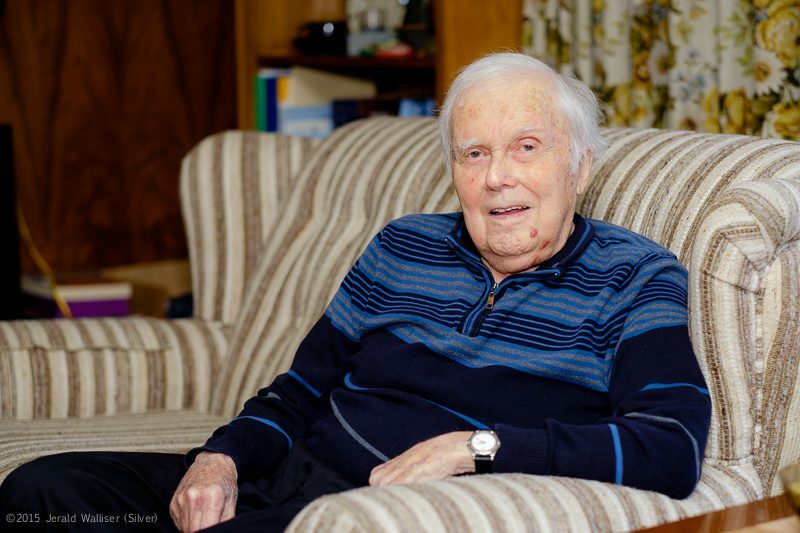 Hank spent just over two weeks in Royal Columbian to recover from his small vessel stroke. Dr. Selig Wilansky was the hospitalist who oversaw the day-to-day care during Hank’s stay. Back at home and playing host to a visitor on this particular day, Hank and Carol have brought out a few mementos from Hank’s time with Terry Fox. These include a Maclean’s magazine with Terry on the cover and some commemorative stamps issued months after Terry’s death.